168 / Getting a fun surprise in the mail! My friend got me all geared up for the coolest outfit I'll ever sport in a half marathon! I can't wait to find a shirt to get that silhouette & those words on... & a sparkle skirt? This may very well be my favorite outfit that I may wear every day of my life!!! 169 // as frustrating as it was to get my tooth all prepped up & ready for my crown & then finding a stupid dang-gone hole in it, I am thankful they found the hole before they glued it on. If they glued it on & then it was discovered later, they could have blamed ME for the damage to the crown. & it would have crumbled later down the road. So yes, I'm thankful that it was discovered early. 170 // Soooo ... that dumb UTI? It still has a hold on me. But luckily, The Little Clinic I went to sent out another prescription - this time a 10 day supply instead of a 3 day supply - which that is one of the things I'm thankful for - but also because my sweet hubby stopped on his way home from work to pick it up for me. 173 // Precious words. Ricky always calls me on his way home from work but he called me last week & when I answered the phone, he just gave me the sweetest greeting & precious words that brought tears to my eyes. I even told him, I think that's the sweetest thing you've ever told me. 174 // Sold my first knitting piece!!! When I posted my cowl I made last week, I got a message asking if I was selling it. I have been wanting to get an Etsy store going & this has just been the push I needed. So I did indeed sell it & even got my Etsy logo going. 176 // 40 cents off gas! 179 // Already talked about this on Tuesday - but my NON STOP 5k! I am still so thankful that this old body could do something new! 181 // Ricky & I had the BEST TIME after the race. Stopping at Panera, Starbucks, Hobby Lobby, enjoying the weather. It was just a great day. 183 // Tried new church. It's been really interesting getting out & seeing the dynamics of other churches in the area. 187 // Run outside kinda evening. 190 // Love a few of the race pictures that the race photographers got of Ricky & I. Just us. There is one that I love - I probably won't show it because I hate my profile & get so aggravated about a certain area of my body... I know, I know... but they got a picture of Ricky & I just looking at each other smiling the biggest smiles. It's the most real smile I've ever seen a picture of me doing. I may have to order it for my own viewing pleasure. Happy memories. 192 // Ricky went out late in the cold, snowy rain to get some Benadryl for Bruno. His skin has been acting up again & he's been so jerky & twitchy with it, he can't even rest or sleep. So Ricky ran down to get some Benadryl to help him... & Bruno slept like a baby all night long. What are some good things that has happened to you this week? yay for selling knitting stuff! i've sold a few pieces as well and i always feel weird doing it. i crochet for fun and it was weird when someone wanted to buy something from me. 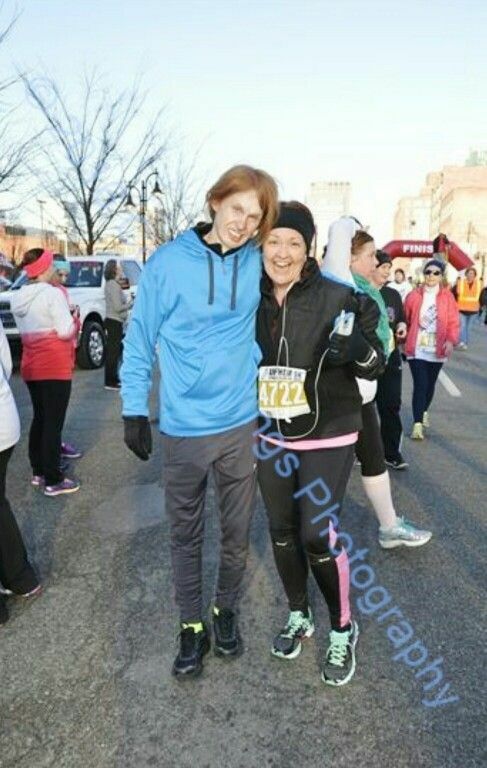 Aww... those race photos are so cute! And I love that race outfit you have planned. It really is a nice little boost to have a special outfit for a race. I neglected to do that for my Spring half marathon and it's in a couple weeks so probably too late now. But I'm definitely going to try it for my Fall race in Vegas. Make sure to try the new stuff on a run before the race so you can make sure it doesn't chafe in weird places or anything. I'm glad I tested my costume before the Disney races because it had pieces which actually cut up my arm while running. It was an easy thing to fix but I wouldn't have known I needed to fix it if I hadn't tested it in advance. 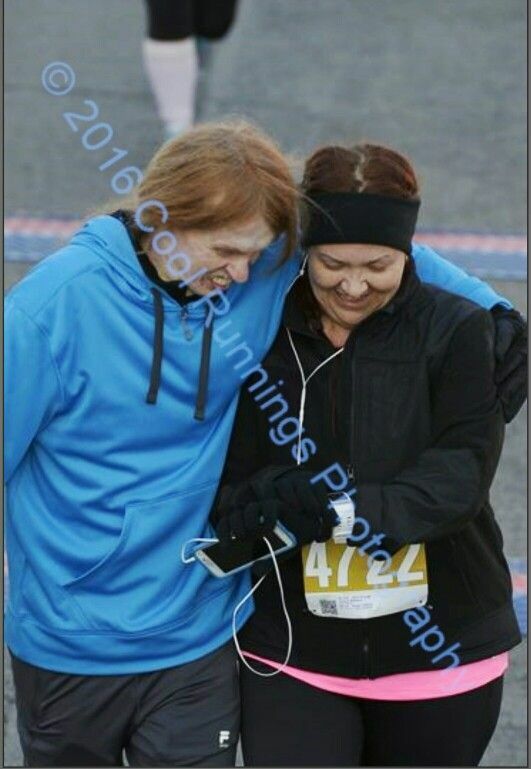 Aww, love the race photos. Congrats on getting your etsy store up. That's awesome! 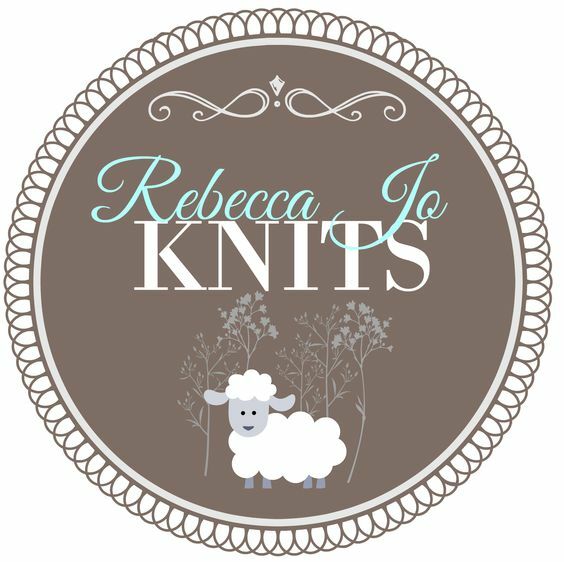 How about Rebecca Jo's Knits and Pics? That could incorporate both. I have literally ZERO helpful statements to add about your Etsy shop name, but I think that's so exciting & the logo is adorable, even if you end up changing the name. How wonderful to get that push you needed to finally start to open shop! Awww, you guys are so sweet! You should definitely order the picture for yourself! I can't wait to peruse your etsy shop! Maybe "Rebecca Jo Creates"? I dunno but I'm sure you'll come up with the perfect name! The race pics of you and Ricky look so good, really captures your love. Surprise mail is the best :) You can never have too much sparkle. Kudos on selling your knitting. Congrats on selling something! So awesome that you're going to open a shop! Those race pictures are so great. I always love the pictures with the super genuine smiles. girl, don't be mean to yourself. look at that photo and tell yourself that you love it and don't see any flaws. i'm serious. there is no point being mean to yourself. none. and then share the photo because i want to see it. that belle outfit!!! what half marathon are you wearing that for?! 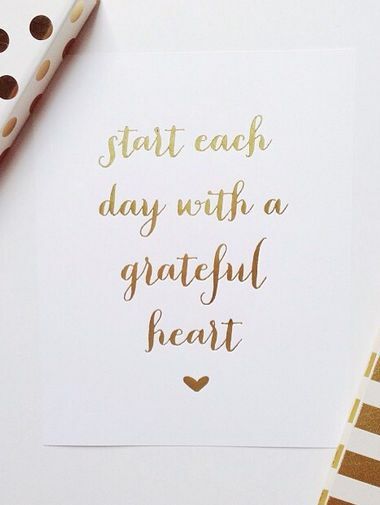 I enjoyed your list of thankfulness! Your journal is a wonderful thing! That sparkly skirt is pretty awesome! You sound just like me with our dogs. If they are too quiet outside for very long, I know they are up to something and make Cory check on them! Ohhh poor Bruno. Hope he's better soon. Can't wait til you get your Etsy Shop going. Aw, you've got such a good catch on your hands! So sweet that he always calls you and says such sweet words!